Apart from the application to pre-cracked bulk materials under static loading, the cohesive model can be applied to almost every problem of the integrity of materials and structural components. 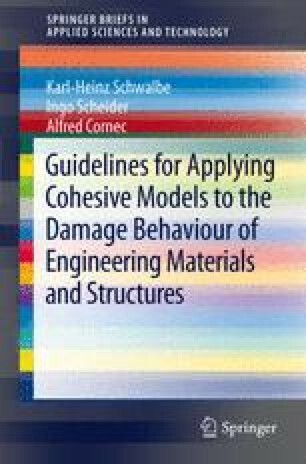 The model is gaining increasing interest for application, it is in particular ideally suited for large amounts of crack extension and the behaviour of interfaces, such as phase boundaries, coatings, bonded joints, delamination in layered materials, and fibres in matrices as well as the prediction of fracture paths. Crack extension in bulk materials will be shown in some detail whereas other areas of application outside the experience gained at GKSS will only be briefly touched upon in this chapter. They demonstrate the enormous range of problems which can be treated using the cohesive model.